Kim was featured at Comedy and Poetry: All Black Affair in MD, Dec 2016. Kim hosted an open mic for Speak Peace Ent. in VA, Dec 2016. Kim acted and danced in CAPAC’s: Langston Hughes’ Black Nativity at the Hylton Performing Arts Center in VA , Dec 2016, (6 performances). Kim acted and was one of the featured poets at the Lt. Joseph P. Kennedy Center in Harlem, NY. Kim was featured at NVCC (college) in VA. In October and November Kim taught & mentored middle school students in DC on achieving goals, writing, poetry and how to “present” poetry. Kim hosted an open mic for Speak Peace Ent. in VA, Nov 2016. Kim acted, was the host and one of the featured poets at the Lt. Joseph P. Kennedy Center in Harlem, NY, Oct 2016. Kim was the featured poet at Artopia at in DC, Oct 2016. Kim was featured as a poet and a motivational speaker at Domestic Violence Unmasked in DC, Oct 2016. Kim hosted an open mic for Speak Peace Ent. in VA, Oct 2016. Kim hosted an open mic for Speak Peace Ent. in VA. Sept 2016. Kim was featured at Artopia in DC, Sept 2016. Kim was featured at the “East of the River” Showcase and Book Collective at the Anacostia Arts Center in DC, Sept 2016. Kim was the featured motivational speaker at the Hotel RL Baltimore. Her topic was: Fear, doubt and haters can only win if you give them the victory, Aug 2016. Kim hosted an open mic for Speak Peace Ent. in VA. Aug 2016. Kim was the feature at Alley Cat in Alexandria, VA, Aug 2016. Kim hosted an open mic for Speak Peace Ent. in VA, Aug. 2016. Kim was the featured poet at Third Eye Thursdays at the Soulful Emergence Art Gallery in Baltimore, MD, Aug 2016. Kim was the feature at First Friday Inspirational Flow in DC, Aug 2016. Kim was the featured motivational speaker at the Hotel RL Baltimore. Her topic: Parents get frustrated and then we get motivated, July 2016. Kim was featured at the 13th Anniversary event for Anti Gun Violence at the Brooklyn Botanic Gardens, Brooklyn, NY, July 2016. Kim was the featured motivational speaker on an online Telesummiit. Her topic: Change Your Vision, July 2016. Kim was one of the featured poets at The National Black Theater in Harlem, NY, July 2016. Kim was one of the featured poets at The National Black Theatre in Harlem, NY, June 2016. Kim was the featured poet at BusBoys & Poets in VA, June 2016. Kim was the featured poet at Poetic Comedy in MD, June 2016. Kim acted and she was one of the featured poets at The National Black Theatre in Harlem, NY May, 2016. Kim facilitated a self-publishing class at Culture Coffee in DC, May 2016. Kim was the featured poet at Say Something in MD, May 2016. Kim was featured at the Power of God event for Speak Peace Entertainment in VA, April 2016. Kim was featured at a talent showcase in MD, April 2016. Kim was featured at NVCC (college) National Poetry Month Program in VA, April 2016. Kim was the featured poet on the WRTR Real Talk Radio in March 2016. Here is a motivational clip from that fun show https://www.facebook.com/jena.brown.351/videos/10154174320049750., (You must be signed into Facebook to view this link). Kim was featured at Color Me Inspired at Trinity Washington University in DC, March 2016..
Kim facilitated a self-publishing class at Culture Coffee, in DC, March 2016. Kim performed at Girl Power- Women’s History Month Poetry Celebration at Brooklyn Boro Hall in NY, March 2016. Kim was featured at Francis L. Cardozo school in DC, Feb 2016. Kim was the host and one of the featured poets at The National Black Theatre in Harlem, NY, in Jan 2016. Kim was interviewed on Talks with Sheba Radio Show on WLVS by the talented Dr. Sheba Holly. Watch to this broadcast at (https://www.youtube.com/watch?v=LJbAzAbkvfs) Jan. 2016. 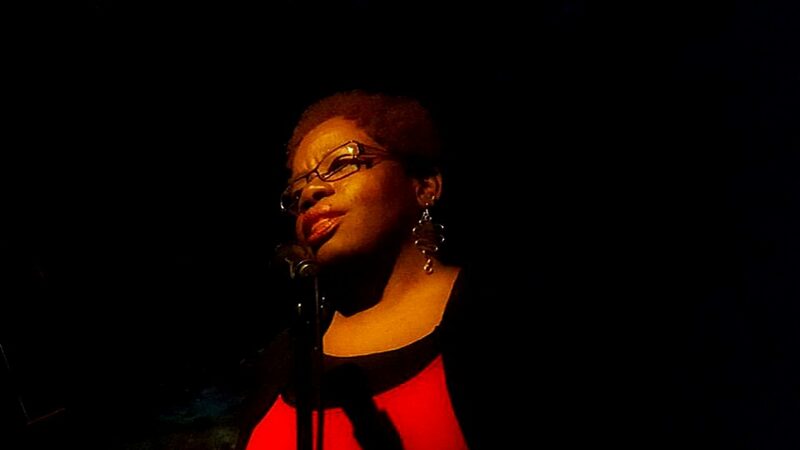 Kim was the featured poet at Wednesday Verses in DC, Jan 2016.